Fine wools have been used for hundreds of years both as regulators of temperature and as marks of affluence. Before and after the Revolutionary War, Americans created wool whole cloth quilts from linsey-woolsey fabric. 19th century wools were created from different weaves, textures, and composition of fibers. This variation in texture creates a wonderful dimensional effect when a wool antique quilt is hug as textile art. In addition to being terrific graphic wall art, wool antique quilts are also a perfect way to keep warm on a cold winter?s night in bed or in your favorite chair. 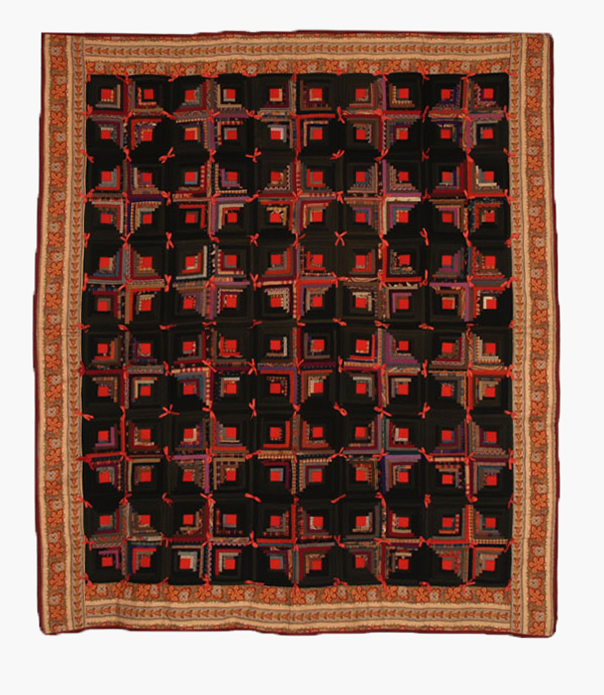 Some of these antique wool quilts even have the added benefit of warm and cozy flannel backing! 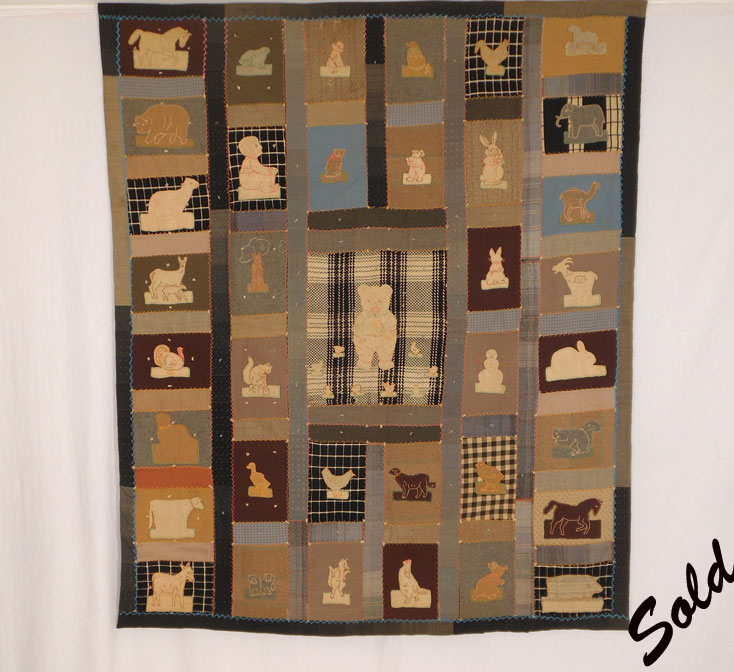 Click on the pictures below to see more views of my Wool Antique Quilts. Shading is due to lighting, not representative of the quilt. Please call for the availability or any questions. A small Crazy quilt that was purposely made as a nice warm wool lap quilt for the New England winters. Created from blocks that have been pieced with various fabrics.... wool, wool challis and cotton flannel. The sqyuares measure apx. 12 inches square. The backing is a cotton flannel making this a very soft and cozy quilt. It had previously been hung on a wall so pockets have been sewn on and it’s ready to hang. Most of the fabrics are from the 1880’s, but since there are also fabrics dating 1890, we need to date it C.1890. This funky little fragment is comprised of various wool fabrics, both in texture and design. 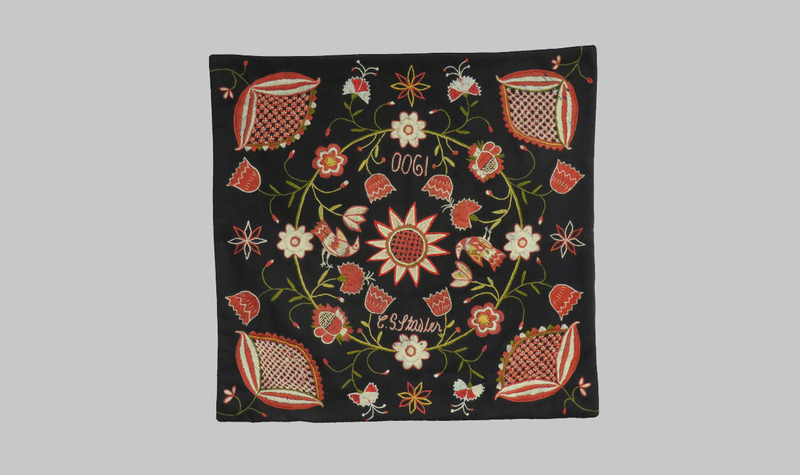 Pieced by hand and tied with colorful yarns, this little fragment has a very folk art feel. The four patch blocks are joined with a 2-1/4” brown wool challis fabric sashing. Each block measures apx 7” square. The backing is a c.1890 stripe in muted black, lavender and yellow. The binding used here came off the original quilt. This quilt art fragment, for your wall. is ready to be sent on approval. Yes, I too have my favorites....this is one such quilt ..Unfortunately pictures, as with many quilts, do not show its true beauty and sophistication. 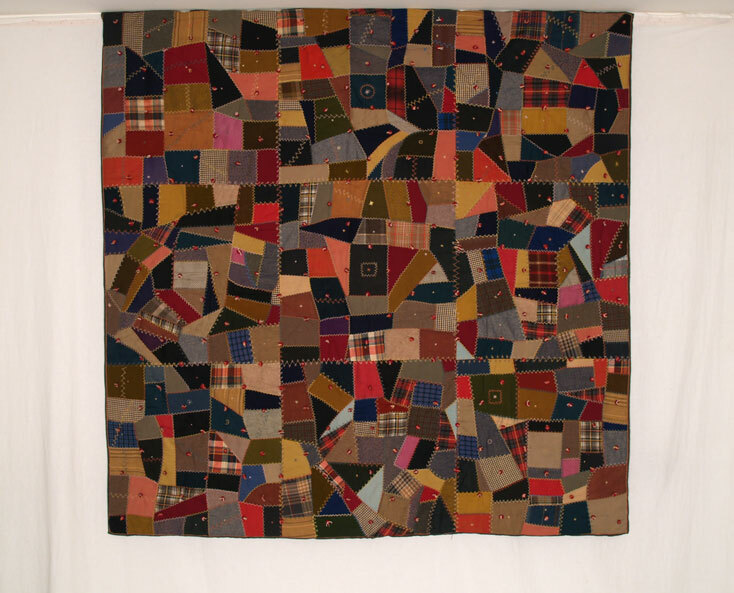 This mid-century straight furrows quilt was found in New England. The pattern is the log pattern and the one that came originally from England. From that original pattern we developed our own variations of the log cabin, patterns becoming the quintessential American quilt patterns. The construction of this quilt is made up of 10” blocks: each block made up of 1/4 to 1/2” width logs with a minuscule 1/2" center chimney. 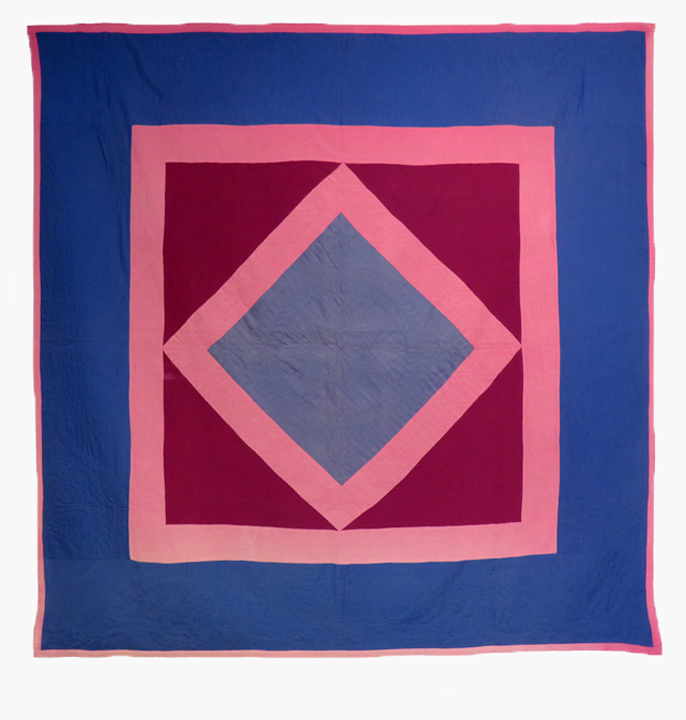 The cotton backing used for this quilt is c.1840 design. The hand applied twill tape binding measures 1/2” and is applied by hand ...the entire quilt is pieced and quilted by hand as this piece was made before the sewing machine was in public use. The fabrics used for the "logs" are a variety of wool challis, an indication that this woman was a member of a family of affluence. The muted colors have created a very sophisticated and rich looking quilt: a major piece of art. I am happy to send this quilt for viewing and approval in your home. The quintessential Lancaster County Amish Bars Quilt is represented here. All wool fabrics date to c.1895 and have been used in the creation of this amazing quilt measuring 69 x 84”. Typically Amish quilts are comprised of few colors. 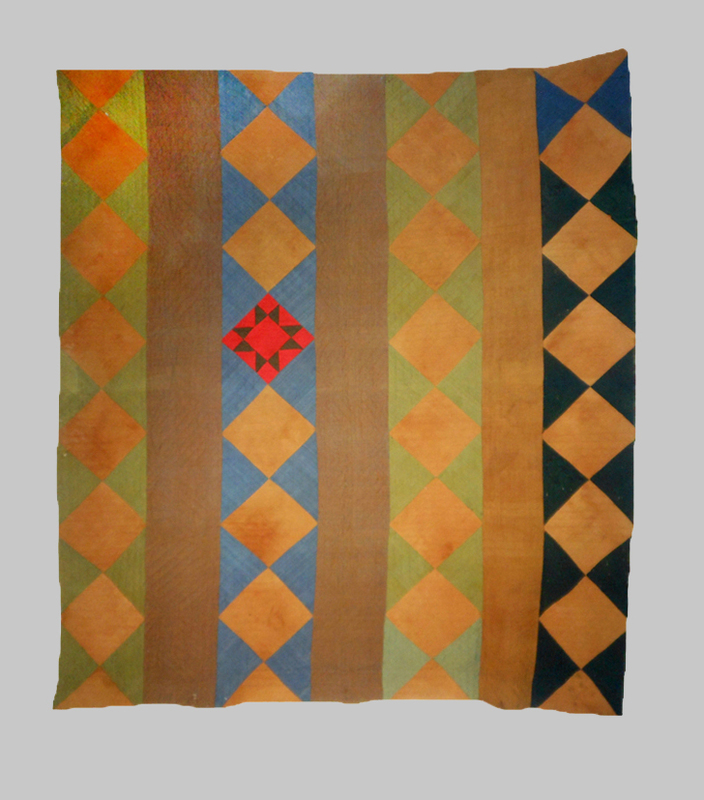 The Amish quilt shown here is comprised of 4 colors. The outside border measures 11-1/2” and is finished with a typical Amish binding of 1-1/8” in width. 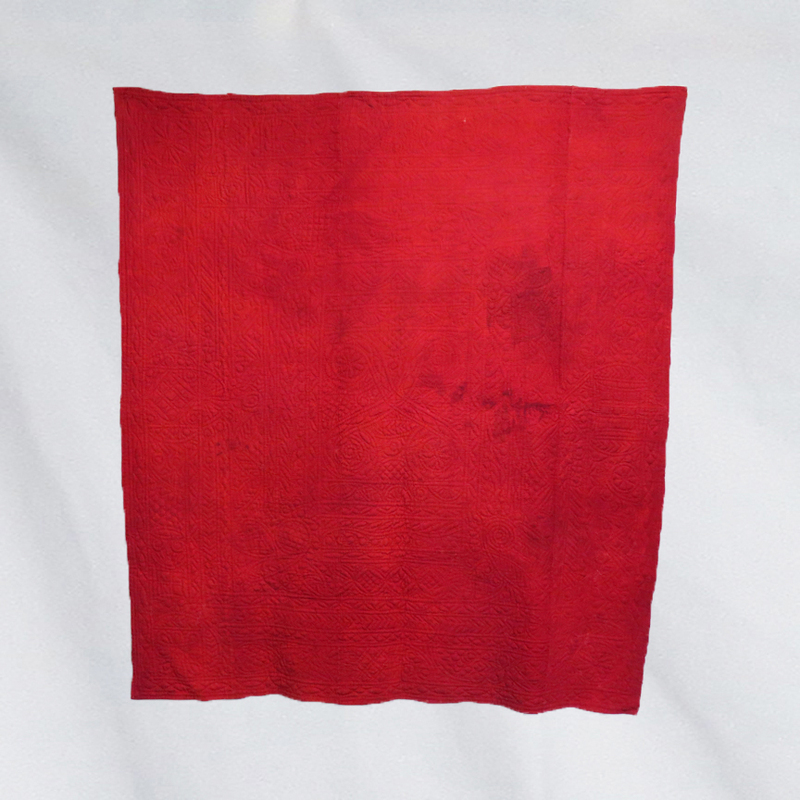 The corner squares, the signature of the Lancaster Amish, measures 12” square. The inner border measures 3-1/4” in width. Inside this border there are 7 bars each measuring 5-1/2” in width. The colors are alternating Prussian blue and olive brown. The outside border is beautifully quilted with meandering vines and leaves. The inner border is quilted a meandering wreath and vine design with a four leaf clover in the middle of the square of the pattern. The bars are quilted on the diagonal in a 1” grid. All Amish quilts are machine pieced and hand quilted. All the quilting stitches are perfectly executed. The backing is a minuscule black and white gingham check. I am happy to send this out on approval. 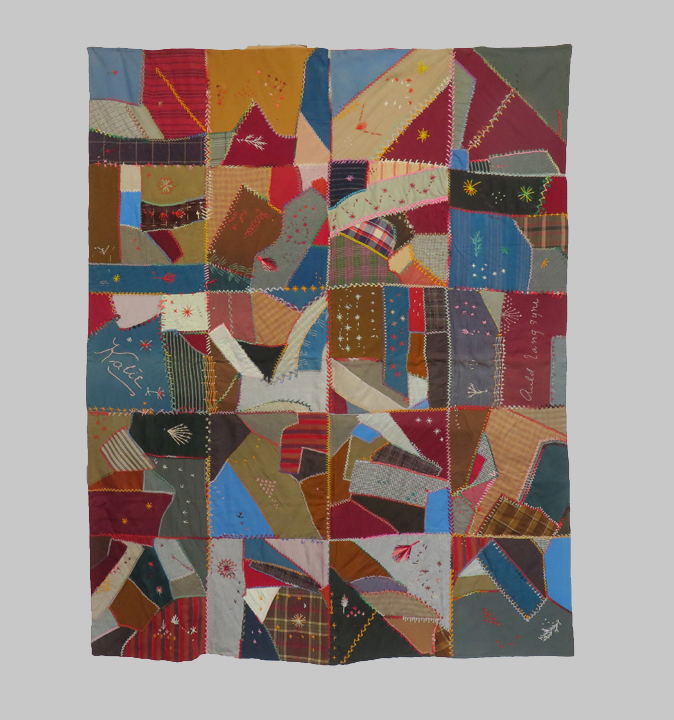 After looking at and researching dozens of Crazy quilts to the best of my ability, I believe that this Maine quilt has definite Native American influence and symbolism. This original piece of art is comprised of 20 blocks, each measuring apx 16” square. A Victorian crazy quilt that is totally unique. There is Native American symbolism thoughout the quilt. This quilt has embroidered names, auld lang syne, staffs of wheat and ears of corn and planted rows in a field. Wonderful colors with wonderful motion and one of a kind. The front fabrics are wool, wool challis, wool silk and heavy cotton. The backing is all wool. This piece would provide great warmth as a quilt on a bed. As a piece of art,on a wall, this quilt would be artistically wonderful and soothing to the eyes. Ready to be sent for your viewing and approval. This truly magnificent Diamond in a Square is quintessential Lancaster Amish...We know this because of the corner squares. Shown here are some of the most elaborate and unusual quilting designs that I have ever seen on an Amish quilt. The center diamond on point measures apx 27 x 27” with a radiating center LaMoyne star surrounded by an elaborately quilted wreath design. In between each section of the Ohio or LaMoyne star, there are quilted 4 cloverleaf designs. The triangles surrounding the square are quilted in outlines of beautiful tulips, stems, meandering vines and buds. All quilting is done in slightly contrasting thread. The outside border measures 14-1/2” with the quilt finished with a 1-1/2” flat binding... also typical Amish. The inside border measures 5-3/4” and contains a meandering grape vine with grapes and leaves. The 4 corner blocks are apx 13-1/2” square and have meandering vine quilted in the shape of a horseshoe. The back fabric is a beige flannel with a floral block print. All Amish quilts are treadle machine pieced and hand quilted. Because the material on the front is all wool, there are places where moths have been... some of the holes have been reverse appliquéd...This, to me, is character, and has resulted in a wonderful price for this amazing textile. Ready to be sent to you for viewing and approval. 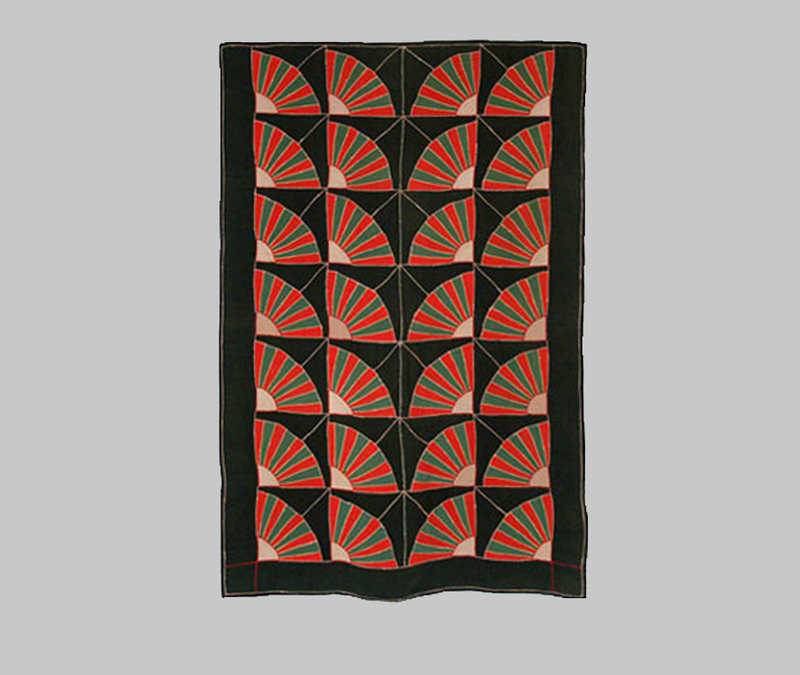 A rare, unusual and whimsical homespun woolen blanket, created in mid 19th century is believed to be from VT. The weaving consists of hundreds of 4” squares joined with a woven three line blue then ecru then blue diagonal stripe. Each block is embellished with indigo folk art wool embroidery. This wonderfully warm homespun is not perfect. There are a few moth holes which could be woven, and some wear on the fringe. The edges have been turned over 1/4” and hand stitched to finish the textile. 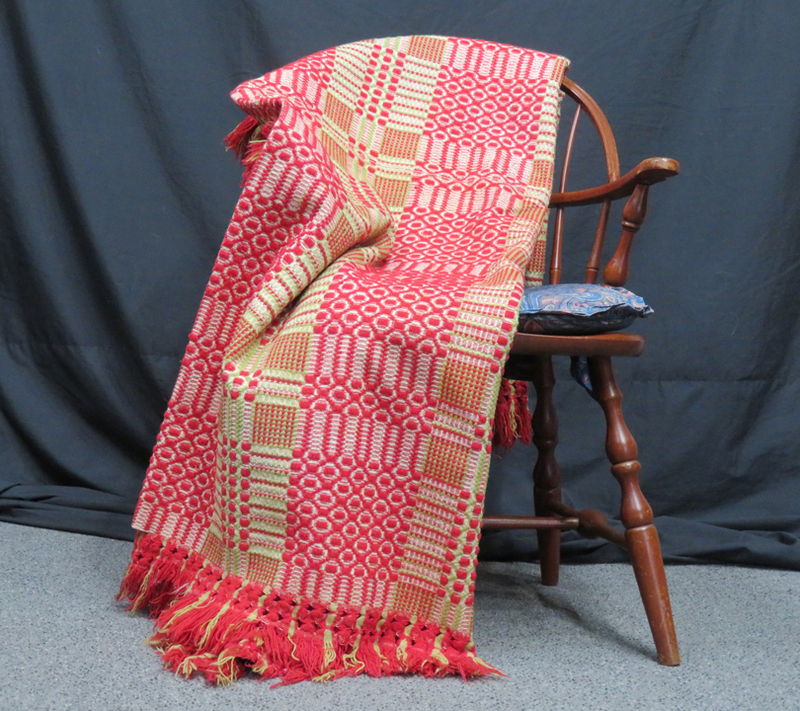 The fringe has been tightly whip stitched to the blanket all around three sides.. Organically hand washed and now ready for your approval at home. 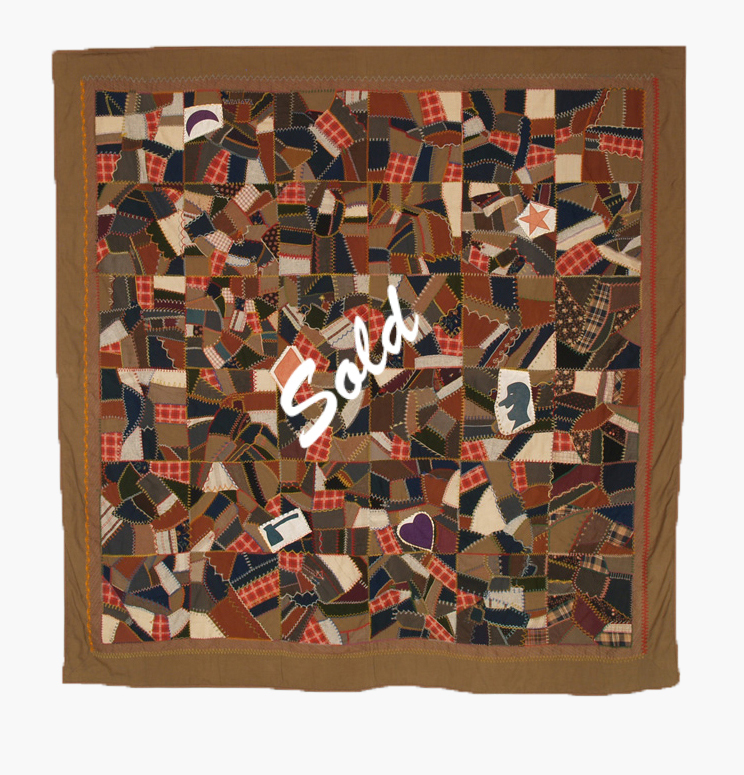 I will classify this original folk art Crazy Quilt as “off the charts”! It’s spectacular! This quilt is truly a piece of art. Comprised of 12 20” square blocks, using fabrics that are mostly 1890’s wool and wool challis. The backing is 1880’s - 90’s flannel thus creating not only a warm, but a very cozy quilt. Much of the embellishment on this quilt is three dimensional. There are a lot of unanswered questions on this piece. I have a feeling it was made by Grandma, whose initials may have been V.B.M. Many of the blocks are initialed. Does this mean that many people made a block or were the blocks made in their honor? There is a similar style so I believe it was made by one person, however that is up for discussion. One block has 5 sets of initials all ending in M. Could this be Gandma's children or grandchildren? 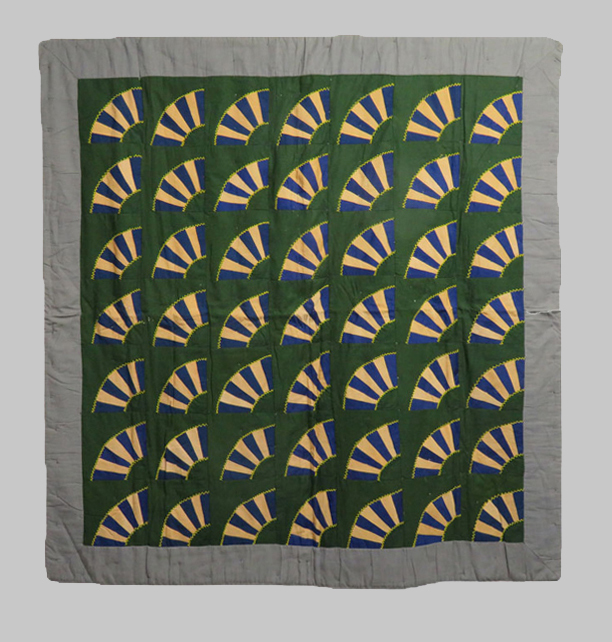 This major piece of textile folk art can be hung in either direction. If you want to rotate it, you’ll see a totally different piece of art work. This is such a happy quilt. I think the creator must have adored her family. Ready to be sent for your approval at home. We have here one of my favorite quilts! My reasons are...I am a fabric junkie...I love optical illusion... I love wool challis fabrics, and I love all of these colors. Art is very personal...colors are very personal...I am just sharing why I am nuts about this graphic piece of art....:-) Comprised of thousands of diamonds with apx 1-3/4” sides, this graphic optical illusion tumbling blocks quilt is stunning. 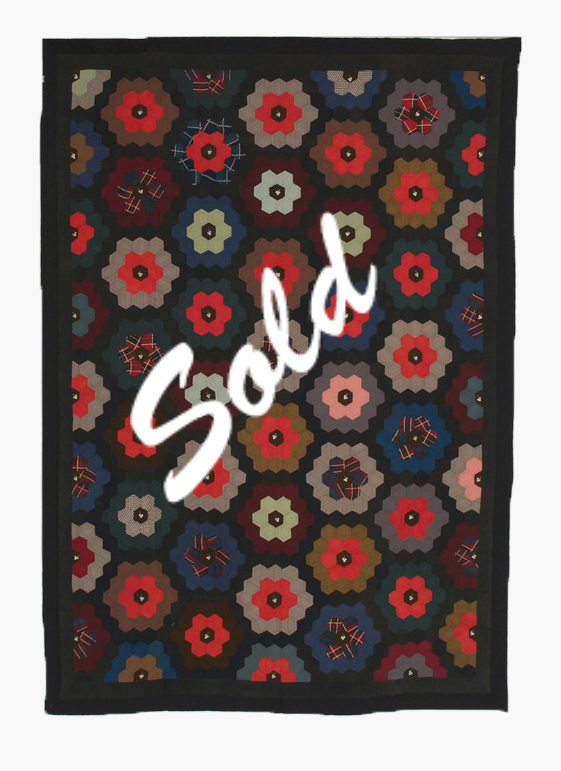 This textile is a beautiful piece of art and could easily be the focal point of your room. Completely hand pieced, created before the sewing machine, each diamond is outline quilted. It’s finished with a solid narrow border finished with a 3/8” early block print wool challis fabric. Ask for more information. Ready to be seen on approval. Hundreds of wool and wool challis triangles measuring 4 x 4 x 6 inches. The quilt is embellished with yarn pom poms every two rows at the top of the triangles. The back of the quilt is a royal blue. The binding is a pillowcase binding with turkey tracks all the way around. I have this quilt on consignment from someone. It is not perfect. There are moth holes and some pieces of wool fabric that are split. However this is not detrimental to an art piece hanging on the wall. Visually it is very folky and graphic. This quilt already has sleeves sewn on the back in case you would like to hang it as art on a wall. This truly amazing early linsey woolsey quilt has been vegetable dyed in a burgundy wine color not found in the northeast US. The berries used to dye this quilt are indigenous to the south. Quilted with homespun thread in a herringbone pattern, this early quilt would have served a wonderful purpose keeping people warm in winter. The creation of this quilt from start to finish could possibly have taken 2 years. Complete original condition and ready to use. Warm and cuddly and beautifully graphic. This is the perfect description for this wool and wool challis crazy quilt. Created in Pennsylvania with wools of very different weaves adds to the interest of this quilt. The addition of a triple border is unusual for a quilt of this time and actually the only one I have ever owned. 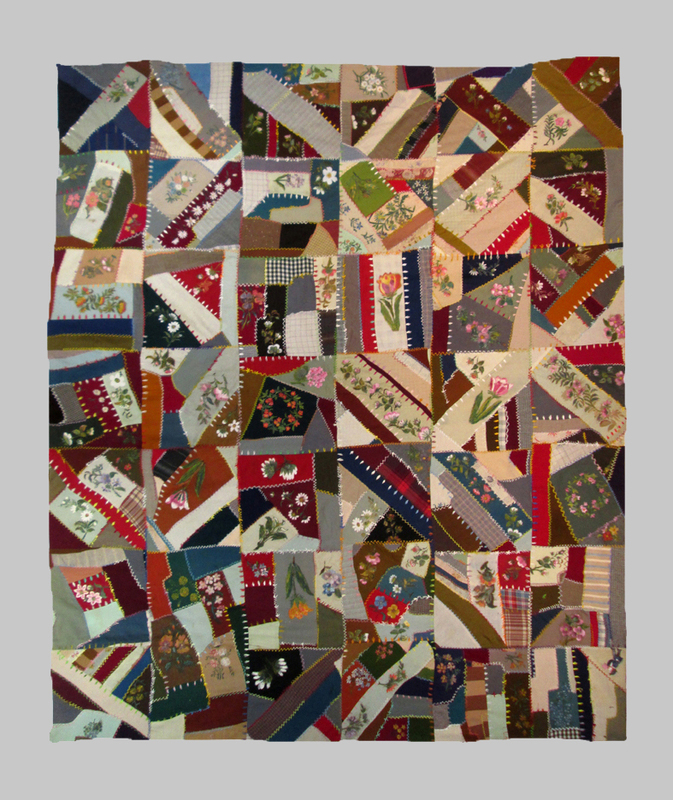 The main body of the quilt was created using 12 blocks with 15” sides and then adding a 6” triple border on two sides and a smaller border top and bottom. 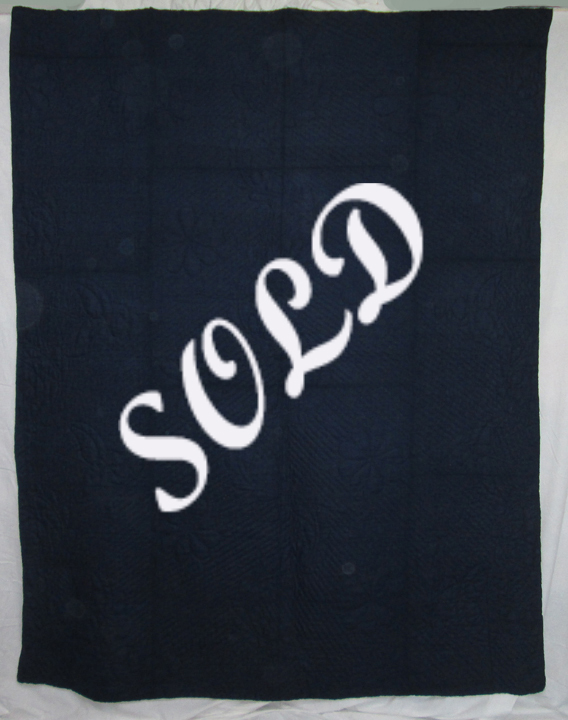 This quilt is bound with a 3/8” wool fabric and top tied with blue wool yarn. The backing is an exquisite 19th century paisley in blues and browns. 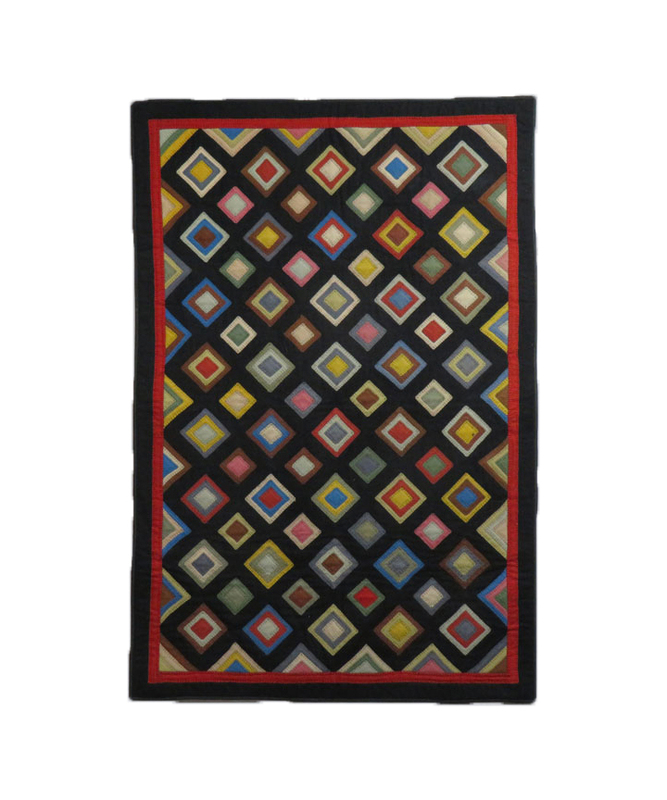 The deep rich colors create a very sophisticated quilt. In perfect unused condition and ready for you to either use or hang as an art piece. This quilt already has sleeves sewn on the back in case you would like to hang it as art on a wall. This is a quintessential Lancaster County Amish Quilt. When you ask any lover of Amish quilts what is the quilt they must own, most will say A Diamond in a Square. This early rendition has been created from wool crepe and always from their specific clothing colors. Amish quilts are machine pieced and then exquisitely hand quilted. This piece is no exception. 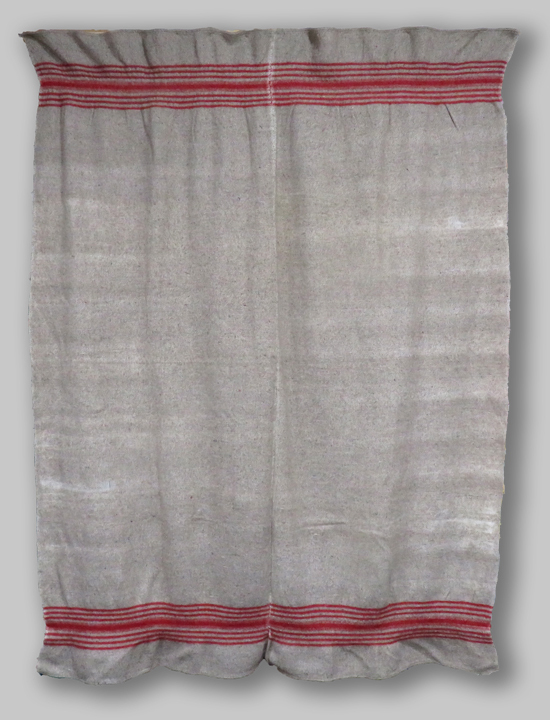 The backing is a late 19th century stripe. It’s acceptable for a stripe to be on the back of the quilt but never on the front as that would look pretentious and not a fabric they would wear. The outside binding is the typical 1” width, the next border is 11-1/2” and quilted with wreaths and stars. The inner border is 4-3/4” in width. The outer block is rich purplish blue, followed by rose, magenta and slate blue. The inner corner triangles are quilted with vines of grapes and tulips. 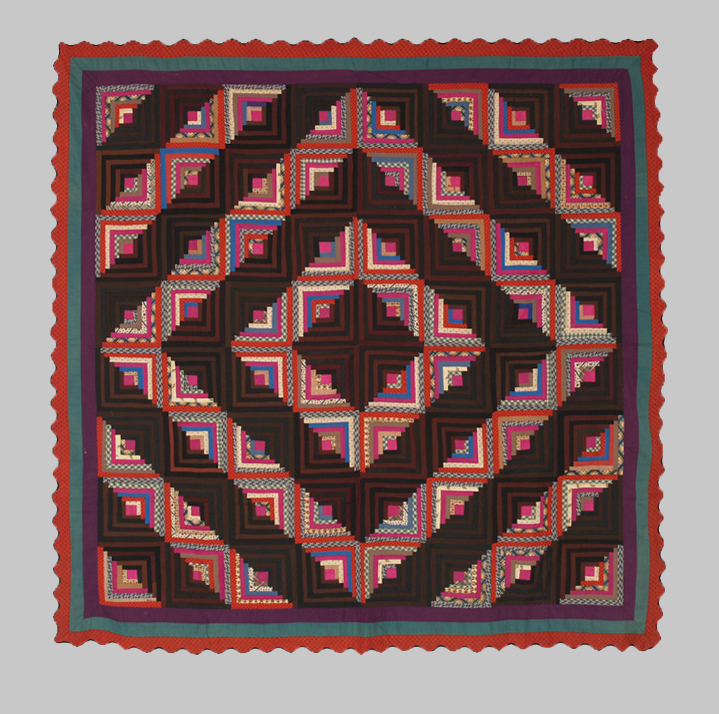 The inner most border is quilted in a modified herringbone and pinwheel. The center diamond in a square has an 7 pointed star, triple line quilted and surrounded by a beautifully quilted wreath. Each corner has a quilted design 6 pointed star. 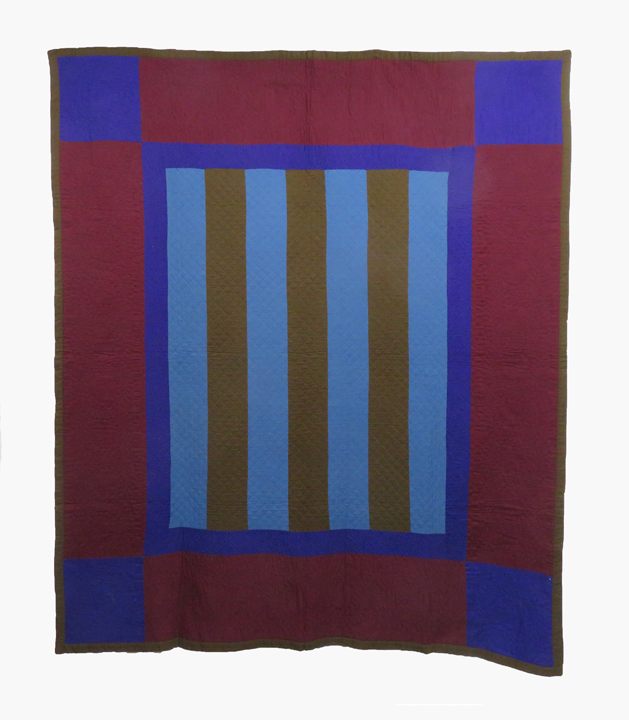 This sophisticated and naturally simple Amish quilt is a major piece of art for your wall or will fit a queen size bed. Ready to send on approval. Please remember that colors aren’t exact when seen on your computer. How modern the graphic art work seen here is on this quilt. Hard to imagine that this quilt is over 100 years old. The center medallion,of this quilt measures 32 inches square. The design for the first center medallion quilts came to America from England in the 18th century. Radiating borders are always seen on a quilt of this design. Here the borders from center to the outside edge measure 3”, 2-1/2", 3", 4-1/4”, 2", 4-3/4” and 3-1/4". The edging of this quilt is pillow cased and then topped with a blanket stitch. I believe the center medallion was made from a woman’s woolen shawl. The style is called Center Medallion, however originally they were very sophisticated and created by affluent women. This quilt is the antithesis ...being the quilt of a rural, country quilt maker...who never knew that she was creating amazing art for the 21st century! 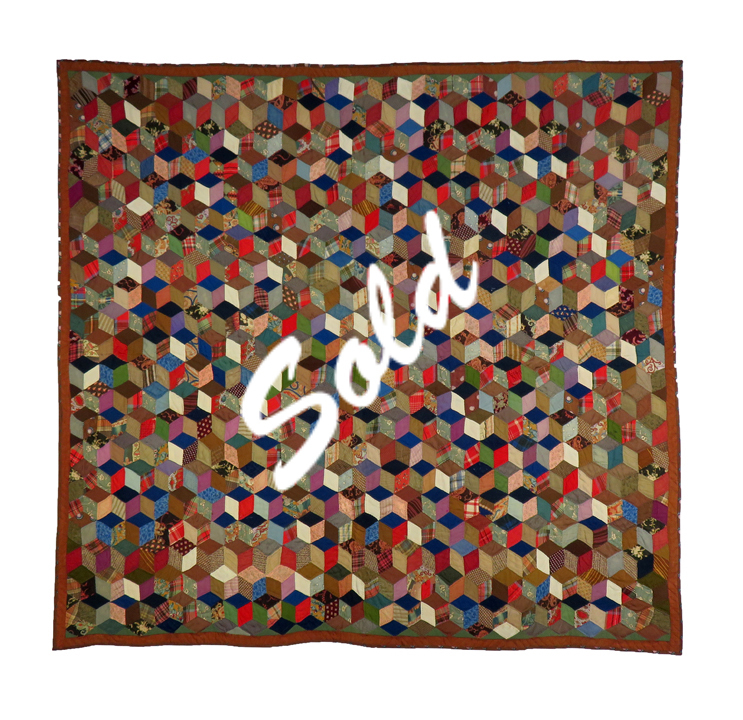 In complete original condition, this amazingly warm quilt can become a beautiful piece of art for your wall. An amazing piece for bed, couch or wall and ready to be seen on approval. This quilt is how we kept warm in New England. There is nothing warmer than sleeping under wool. In this case, two layers of homespun wool. The front of this quilt is a whole cloth, homespun Linsey Woolsey. The front and back are two different colors. 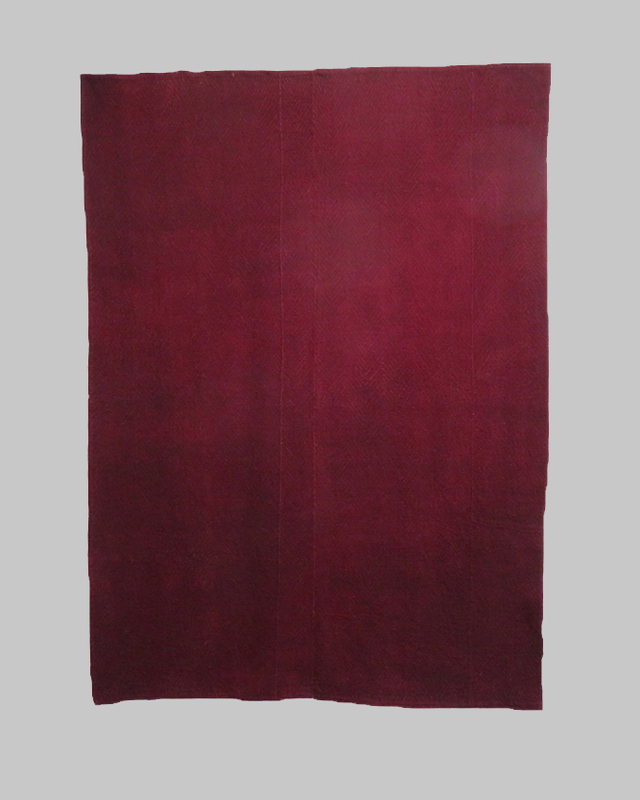 The front beautiful red color was achieved using a bath of cochineal. The quilting on this is absolutely amazing. Intricate in detail and a beautiful pattern. 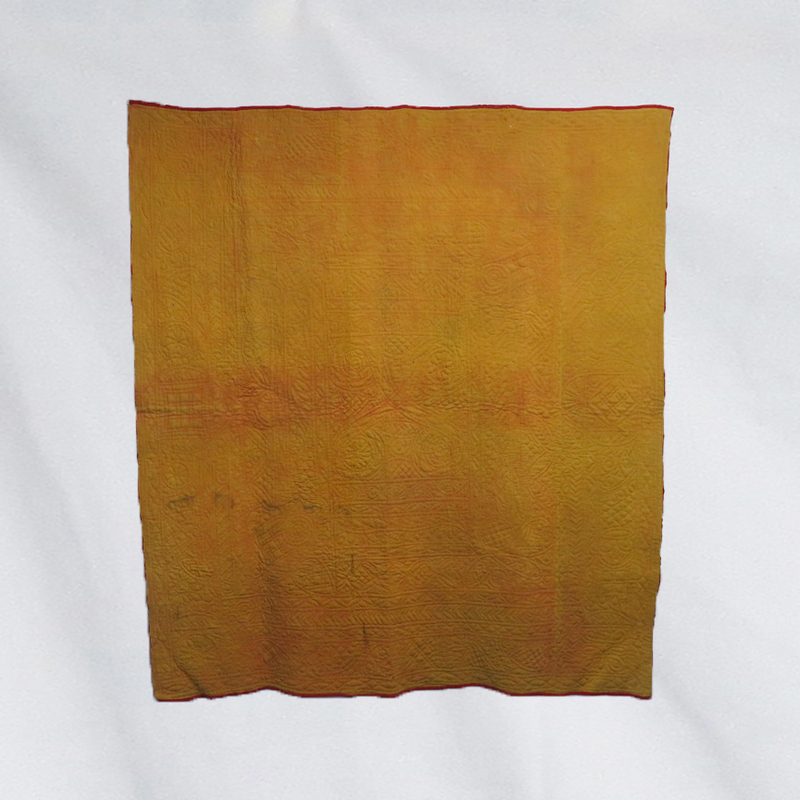 The back mustard color was achieved using a bath of saffron, turmeric or safflower. The backing, also homespun, is more loosely woven, as people thought that the back was not as important as the front. Since the weaving was so time consuming, the back is not as defined as the front. Normally this quilt is worth at least $8,000, however, when I purchased it I thought I’d be able to get the stains out, but was unsuccessful. This is one of the heaviest quilts I’ve ever washed. Parts of the stains are on both the front and back, thus the lower price. This quilt already has sleeves sewn on the back in case you would like to hang it as art on a wall. Many of my very favorite quilts are made from wool challis. This Wool Challis Log Cabin Barn Raising with a Diagonal Bar or piano key border measures 85 x 85 inches and was created prior to 1860. The pattern was constructed from 9-1/2 inch square blocks comprised of logs measuring approximately 1-1/8 inches in width and of various lengths. The 5-3/4 inch border is beautifully executed using a piano key diagonal bar pattern. The outside edge of the border has a 3/8 inch hand-applied binding. Most unusual for a quilt of this age is the fact that the quilt squares were assembled by machine. The bars overlap on the border and the blocks are used in a design where you don’t see any of the stitching on the front of the quilt, only on the back. The center four patch of each block, also known as a chimney, measures 1-1/2 inches square. The chimneys are comprised of four tiny squares, two red and two blue. Usually when you see a blue center square on a log cabin it signifies that the home is a safe house for runaway slaves. The date of this quilt works for that, however, I can’t definitively attest to that fact. This quilt would fit perfectly on a queen or double sized bed or become a dynamite piece of art for your wall. The color palate is seen in many Pennsylvania quilts. In unused condition, ready for your home. This absolutely spectacular wool quilt invites close inspection of the wide variety of plants and animals skillfully embroidered in colorful pearl cotton. Cut from men’s suiting wool, the interior blocks measure approximately 7 x 12 inches, and the border blocks are 4 x 8 inches. All the seams were embellished with fancy stitching, and the quilt was finished with a pillowcase edging and a circa 1915 whole cloth cotton striped backing in browns and golds. 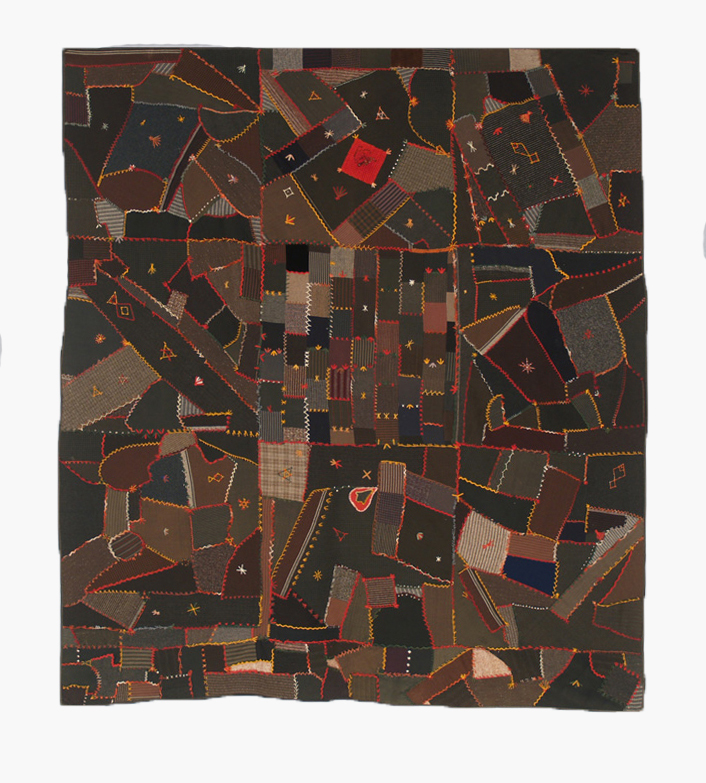 This particular quilt offers multiple clues to its origin, but no clear answers. Many of the blocks were cut with pinking shears; taken perhaps from a suiting sample book? Perhaps the quilter had access to a tailor’s remnants? Dated 1926, twelve triple initials have been included, all skillfully stitched in equal size, with nine of them ending in the letter “L”. Was this quilt made by one person who chose to include initials of loved ones, or was it perhaps a more collaborative family effort? Unusual animals such as an elk, a great horned owl, an elephant, and a labeled ibex were included among the more commonly seen domestic animals and plants. The skill and care taken in the creation of this warm, lively, and instructional piece raises the possibility that it may have been made for a special child, or perhaps as a parting gift. While we may never know the actual history of this quilt, we can certainly recognize its value as a superior folk art piece! Please ask Betsey for more information and to see the quilt on approval in the privacy of your home. This quilt is comprised of 42 10” blocks, pieced with silks, wool challis and exquisite embroidery. The border is 4” of wool challis all the way around and turned over edge to the back making its binding. 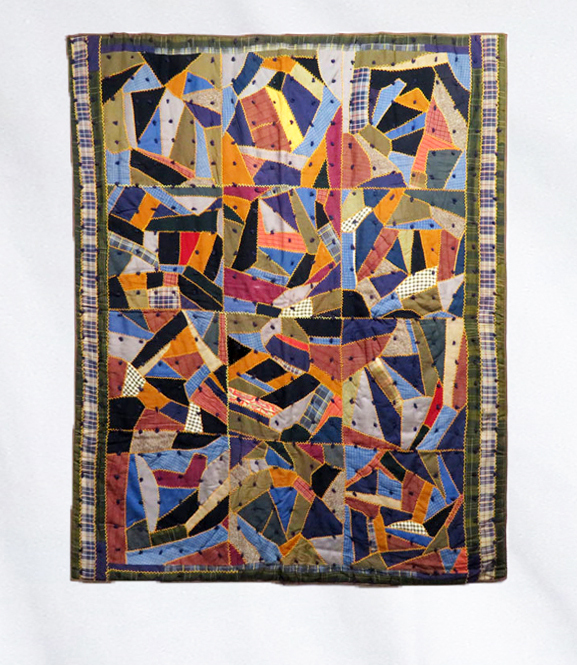 Even though this piece isn’t a crazy quilt, I have added it into this category because of the extensive embroidery. This c.1890 embroidered and crewel worked brick pattern wool quilt is from Lehigh, PA. The Victorian era women loved floral work. 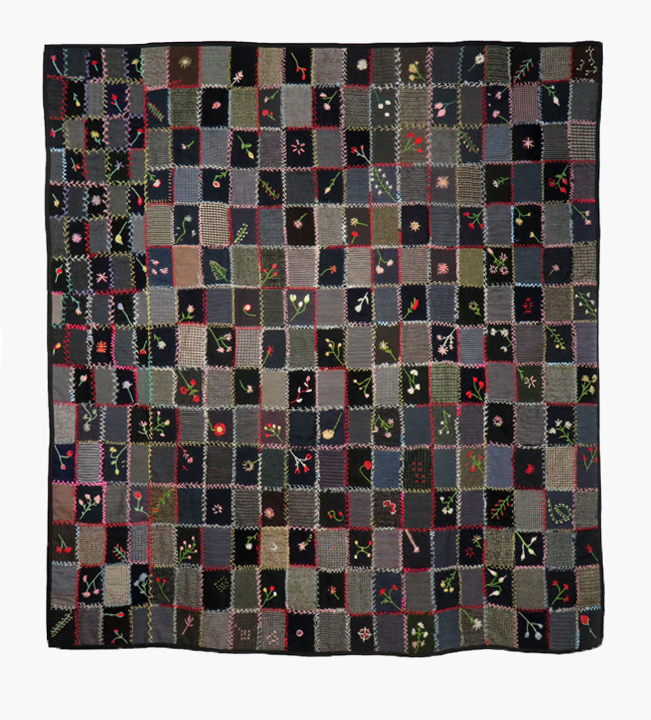 The embellishment on the very happy wool quilt is mostly of flowers augmented with some funky abstract embroidery. I have sleeves already on this quilt because it's hanging in my home. A wonderful piece of art in my library, this wool quilt can be for your couch, your bed or your wall, any area where you just wish to evoke a happy feeling. In unused condition. 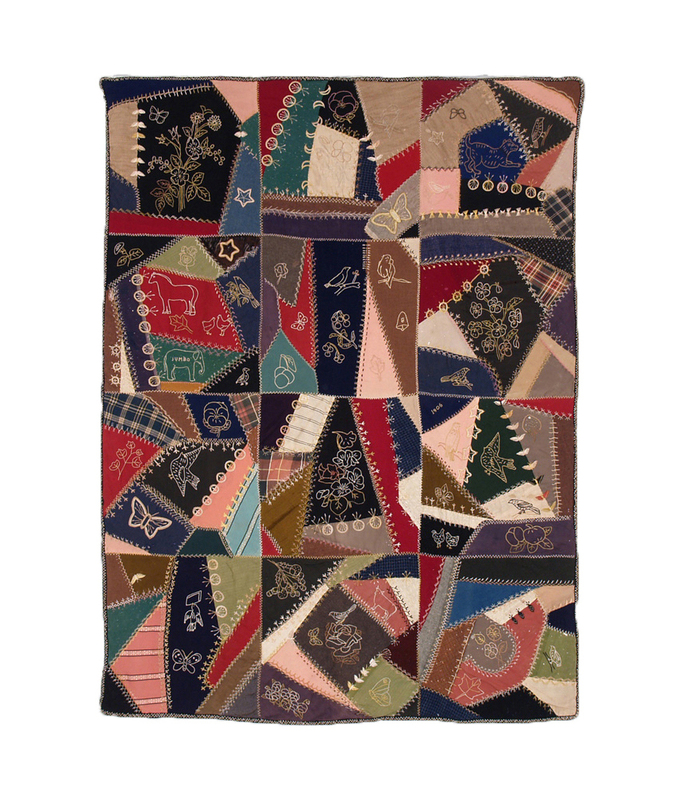 This center medallion folk quilt is comprised of heavy wool and wool knit fabrics in a variety of weaves and muted colors. All hand pieced and hand quilted. The quilting is an example of what the people from Tennessee call baptist quilting, or arc quilting. A truly graphic piece of folk art perfect for a large wall. l Ask Betsey for more details. 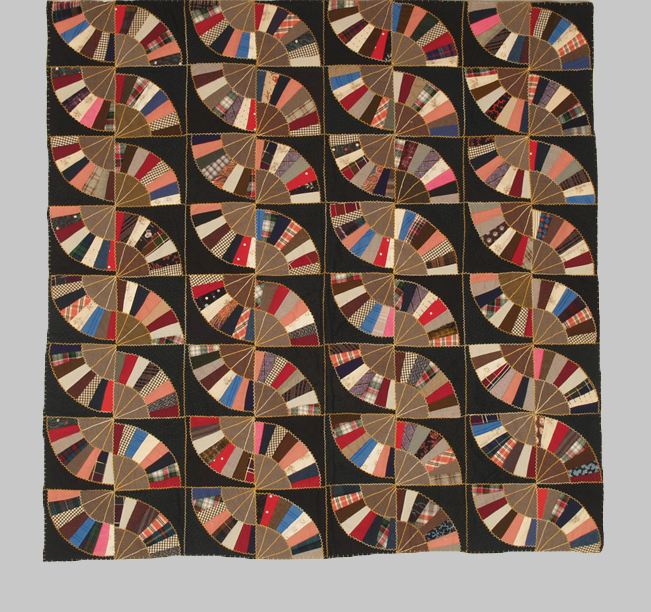 This rare early quilt was originally made for a New England post bed. The reason I know this is because two corners of the quilt that were originally cut out have been filled in with fabric from the top of the quilt. This quilt is history in progress. Indigo dye will not fade due to sun. This is true of only two dyes, the other one being true turkey red. The top is an early wool homespun, very possibly created and spun from wool from their sheep. One clue to this is that the quilt has a wool batting. The back is also a wool homespun more loosely woven than the top. The piece has been beautifully quilted with early linen thread. There are a few original moth holes, some of which have been previously woven. A point of interest: beware of any woolen quilts someone says are very old, but which have no moth holes. It is quite possible that these are reproductions. This quilt was definitely made for warmth, and would be very appreciated on a cold New England night. This wool and wool challis crazy quilt is comprised of 42 12”squares. This quilt is one in a million. There are over 100 flora and fauna original oil paintings covering the entire quilt. It’s actually 42 12” square paintings combined to make up one quilt. The embroidery embellishment surrounding the piece is also beautiful. However, the oil paintings superceed the beauty of everything else. Wool challis always was and remains to be a very expensive fabric. It is a combination of wool threads woven with silk threads. It is executed with an artistic and creative vision. The backing is a 19th century pink peony floral on a brown background. Please look at the close-up photos to see some of the amazing paintings. P.T. Barnum’s Circus is closing after 140 years, making this quilt that includes Jumbo even more collectable. This is a rare and wonderful piece of folk art in its original youth bed size. A wide variety of wool and wool challis fabrics have been assembled into a crazy quilt, with every seam embellished in fancy hand stitching. Absolutely packed with embroidered pictures of birds, butterflies, fruit, flowers, chickens, along with a cow, dog, and a horse. The most historically intriguing animal is the elephant labeled Jumbo on its side. Circus showman P.T. Barnum marketed Jumbo heavily in the 1880s, so it would be a reasonable possibility that this quilt was made by someone who remembered Jumbo or perhaps included the elephant because it was in one of the childs favorite books. Finished with a 1 inch separately applied black binding embellished with a double herringbone stitch, backed with red flannel, and reverse tied with black yarn. 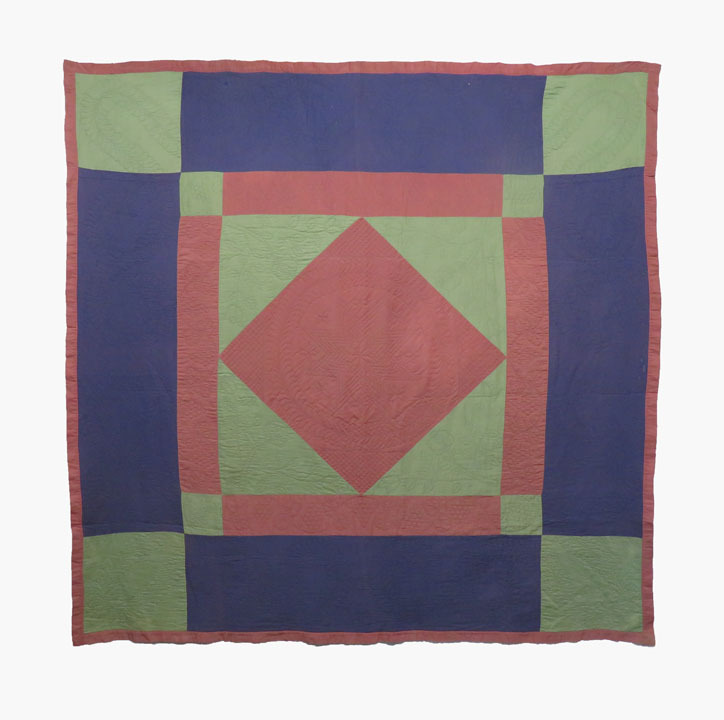 The perfect size for hanging, this quilt retains all of its positive energy! Please ask Betsey for more details. Betsey doesn't come across this particular Log Cabin configuration very often and the color palette in this example is outstanding. Shades of blue, salmon, black and taupe lend sophistication to this quilt and the graphics make it optimal for hanging on the wall as the artwork it is. Blocks measure 6 ¼ inches square with logs 1/2 inch wide. The arrangement of color gives the illusion of Flying Geese as a secondary pattern. Fabrics are fine wool and wool challis with a backing of cotton sateen in a floral print in brown, taupe, cream and white - see detail pics. The quilt is cross hatch quilted by hand which is not visible from the front. The 1/2 inch applied binding is in blue wool challis that has also been used on the front of the quilt. Although the hues are solid most fabrics have a pattern in the grain adding elegance and dimension. This is a stunning quilt in both color palette and design and would make a gorgeous statement on a wall. Skillfully executed it is in perfect condition. 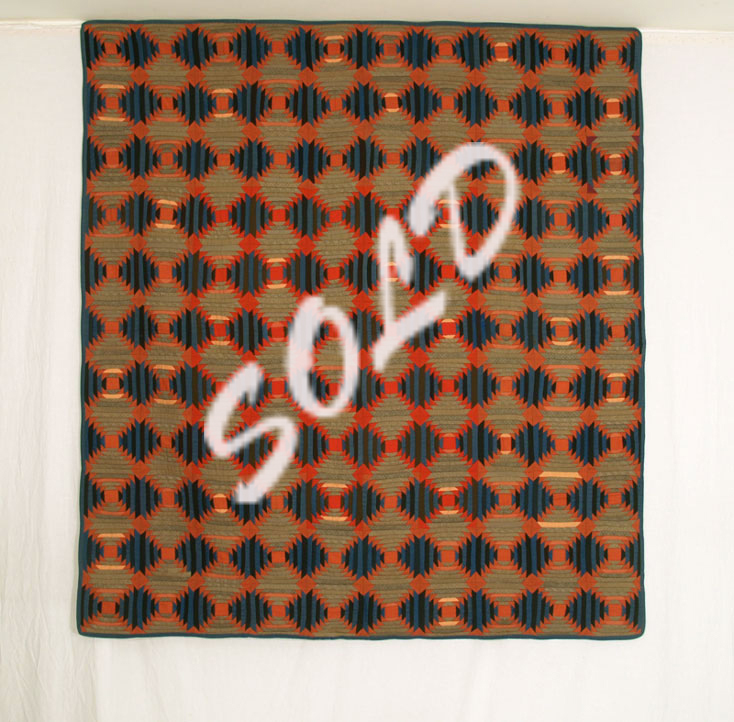 Ask Betsey to see this quilt on approval in the privacy of your home. In excellent condition and in its original hired man's bed size, this soft wool challis quilt is both snuggly warm and graphically wonderful - perfect for use as a sophisticated crib quilt or as wall art. 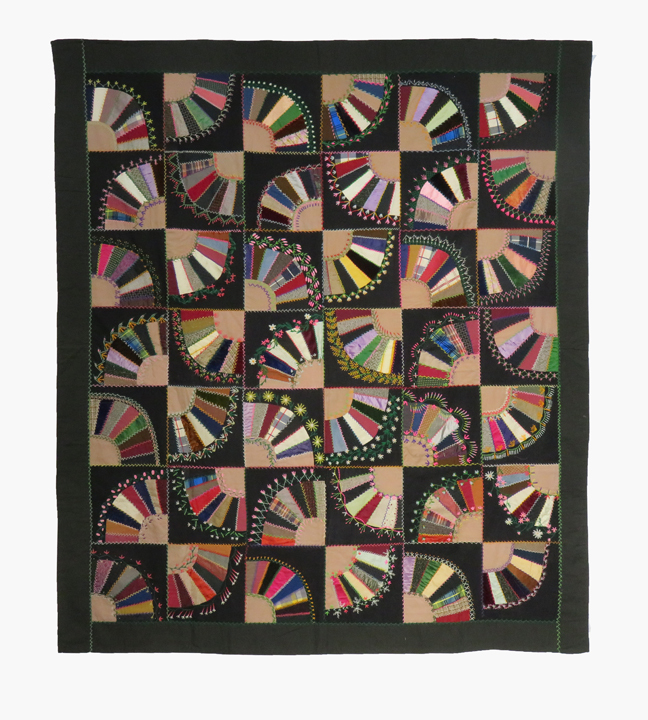 Arranged as a 4 x 7 array of fans this wool challis quilt has a 4 inch solid blackish green border and 28 fans made up of alternating red and green blades and finished with grayish brown fan handles. A small and very even outline track stitch is used as the embroidery embellishment throughout. The backing is a solid red challis with a 3/8 inch applied black green binding the same fabric as the border. A beautiful, warm and sophisticated piece for your child's room...or for any room in your home. Use as either a small bed cover, throw or it would be stunning as graphic art on your wall. Ask us about sleeves for hanging, and to see this quilt on approval in the privacy of your home. 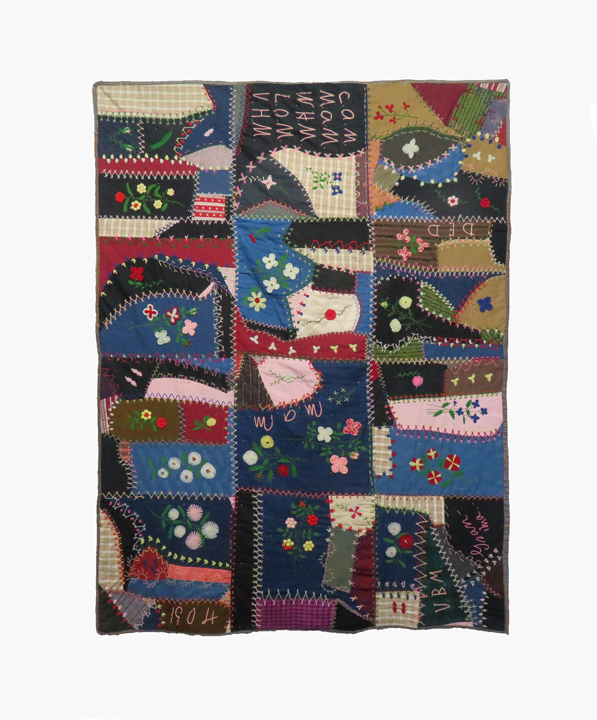 A fabulous folk art crazy quilt comprised of a combination of wool, wool challis and velvet crazy pieces with whimsical wool embroidery. A wonderful palette of reds, blues, russet, greens, browns, and ecru forms the ground of this great folk art piece. The artist used this as a canvas onto which she embroidered large scale whimsical and traditional designs using a variety of stitch patterns and colors of wool yarns in bright, warm hues. Multiple cats along with birds, large bugs and a terrific barn with fence are included with a sentimental 'Think of Me'. In the center of the quilt is the embroidered date of 1900. The name of 'Hatt' as well as initials 'G.D.R.' are hand stitched with wool yarn. The backing is a fabulous and early black, pink and white cotton print - see detail images. Reverse tied with cream wool yarn this quilt also has a pillowcase edging. Multi-hued wool embellishment stitching provides the perfect finish for the outside edges. Charm and a certain 'joie de vivre' combine to make this quilt a great choice as a focal point for that special room. 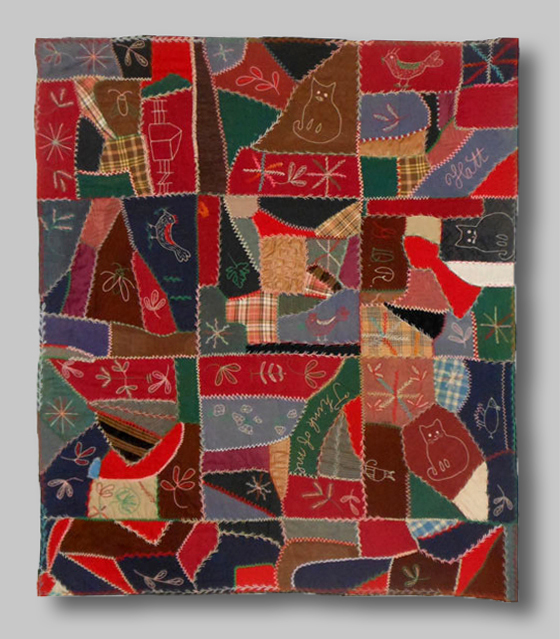 Folk art whimsy at its best, this is a wonderful and unique quilt that can be sent to you on approval for private review. Please ask Betsey for more details. 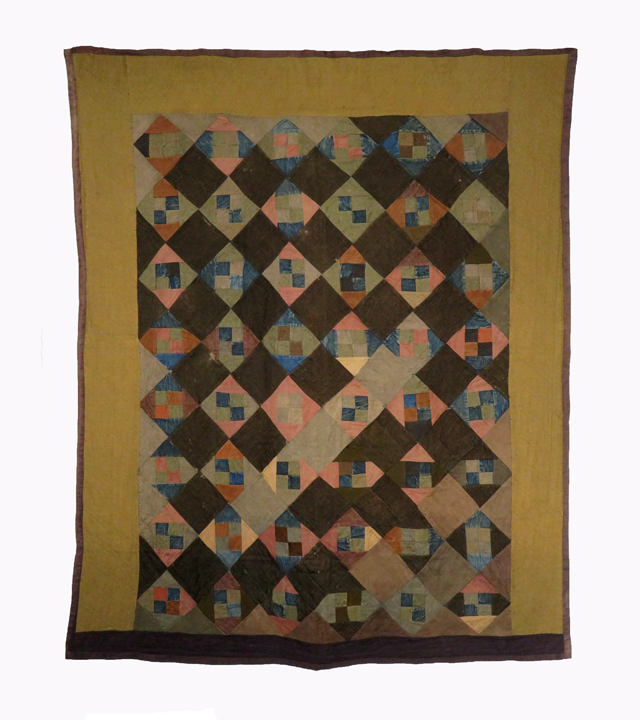 This is a fabulous early 20th century folk art creation using men's lightweight wools for the blocks and original appliques. A unique piece showcasing animal silhouettes embellished with wool embroidery. Both domestic and wild animals (the most domestic being the little human!) include horses, deer, pigs, chickens, a lamb, bears, an elephant, a cow, a camel, a duck, and more. One of our favorites is the snowman. Columns of different sized wool blocks surround a center larger block featuring a bear among other small appliqued creatures. Remaining blocks each feature one applique. Wool embroidery stitching accents the figures and covers every seam. A warm palette of browns, grays, blacks, blues and mustard in mostly solid hued wools with some fun windowpane and soft hued plaids used to great effect. The backing is pieced lightweight wool suiting in various patterns and the quilt is top tied in wool yarn - see detail image. The pillowcase edge makes for a nice, clean finish. This unique and wonderful folk art piece is in perfect condition. Ask to see it on approval in the privacy of your home. 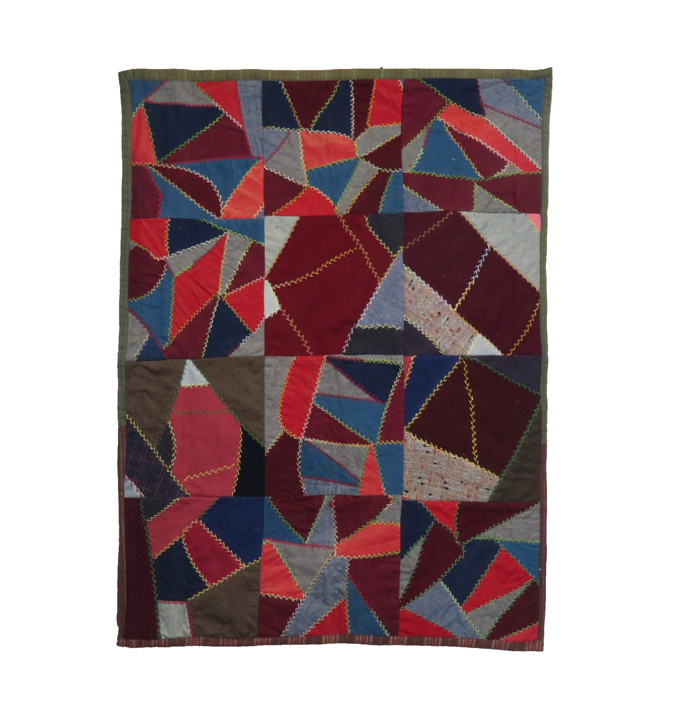 A vibrant Crazy Quilt in glorious rich hues of deep greens, multiple shades of burgundy and wine, various blues from deep to vibrant, taupes, mustard and peach. Comprised of mostly solid colored wools and wool challis there are also some wonderful checks, plaids and textured solids adding movement to the design and interest for the eye. Seams are embellished with both cotton and silk flosses with some embroidered interior motifs giving this beauty folk art flair. Adding to the folk art theme are felted red wool circles with crimped edges at the base of each cotton floss top tie - thus turning the utilitarian aspect of quilt ties into a wonderful design element. See detail images. The backing is a very fine olive green wool challis with darker green specks that has a russet shimmer in the light. The backing folds to the front and is sewn down to form a Â¼ inch binding. Lovely daisy chain embellishment stitching in peach floss covers the binding seam all around. Another wonderful detail in this well thought out quilt. This is a warm and vibrant example of a skillfully made wool and wool challis Victorian Crazy Quilt. 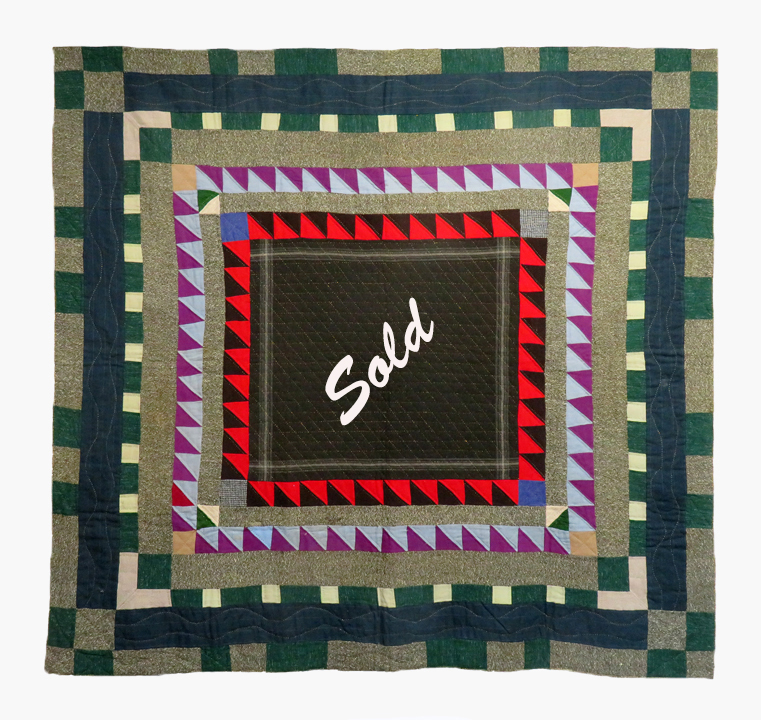 In perfect condition, this quilt can be sent to you on approval for private viewing in your home. Such a fun and graphic wool quilt in a variation of the Hole in the Barn Door, or House Top, pattern. A lovely combination of both wool and cotton fabrics in bold and graphic patterns and colors. Blocks measure 8 1/2 inches square and are pieced both by hand and treadle machine. With such a variety of color in the octagon shapes the maker chose charcoal gray and black wools for each center hole and all four corners of each block. The color just leaps off the resulting black/charcoal gray ground for a stunning effect. Entirely hand quilted with black thread in outline stitches throughout and a large 'X' stitched in each 'hole'. Backing fabric is a lovely rose/mauve cotton flannel - see detail image - with an applied 3/8 inch binding in the same fabric. This quilt is in unused condition with a few original, very small moth holes attesting to it being made mostly from wool. We have not touched them as they do not detract from the beauty of the quilt. A wonderful piece of graphic art for either warmth and beauty on your bed, or for use as a stunning focal point in any room. 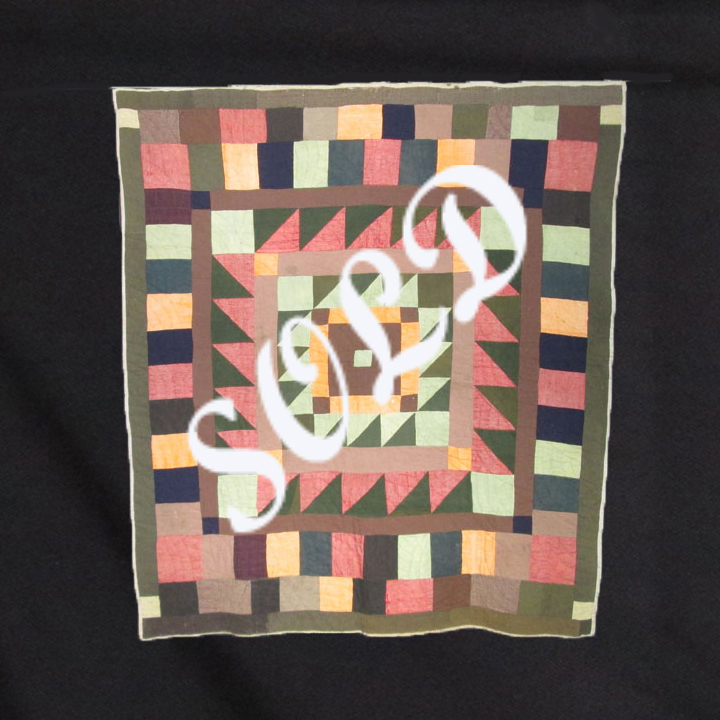 Please ask us to see this quilt on approval in the privacy of your home. A stunning pre Civil War quilt in mint condition from the Lancaster County area of Pennsylvania. This wonderful piece showcases the maker's unique artistic perspective and advanced skill. She took a traditional foundation pieced Log Cabin Courthouse Steps pattern and, using stunning early wool challis fabrics, made it her own. A personal achievement using a fabulous color palette accented with a gorgeous 5 inch wide c.1850 paisley border in wool challis, the addition of red silk ribbon ties at each block's four corners, and an applied brown silk grosgrain ribbon for the binding. A feast of rich colors and patterns is found in the elegant array of deep earth tones set against lavender, blue, green, and red found in each 5 x 5 inch log cabin block. Each block contains 20 logs plus a center chimney. Logs measure 5/16" to 3/8" wide and at each cabin's center is a 1" square wool challis solid red chimney. 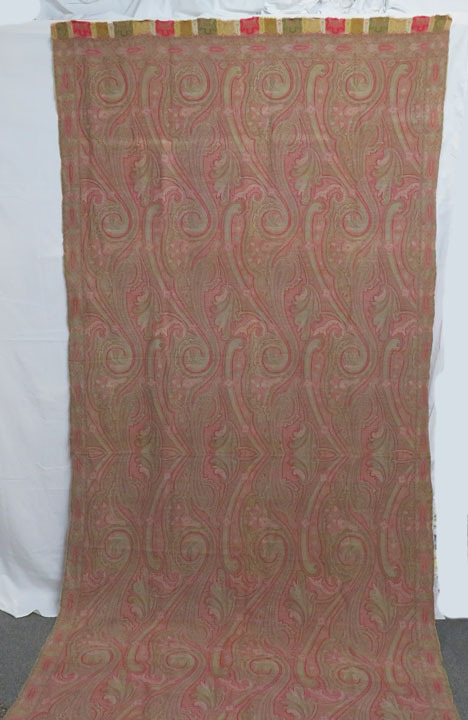 The backing is a red, brown and cream large scale cotton paisley. See detail images. Gorgeous! This amazing antique quilt with incredible visual impact absolutely refuses to sit quietly in the corner. Its size makes it ideal for stunning graphic art on a wall. Please ask to see this quilt on approval in the privacy of your home. 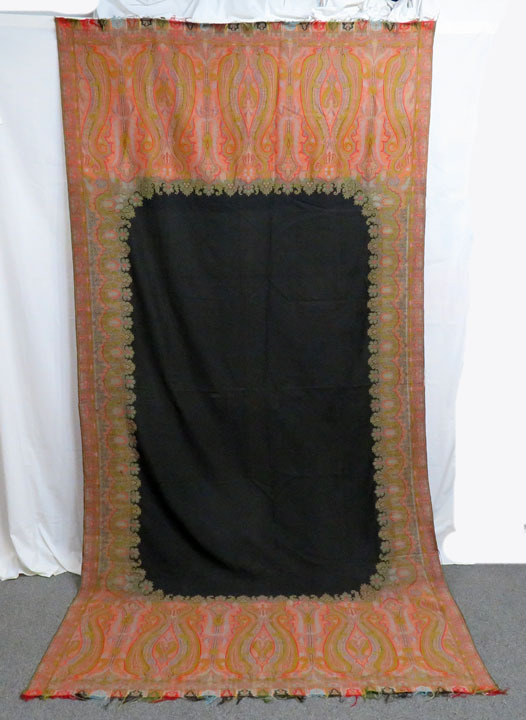 A wonderful piece of textile art in excellent condition this quilt's top is comprised of homespun linsey-woolseys and wool challis from circa 1855. 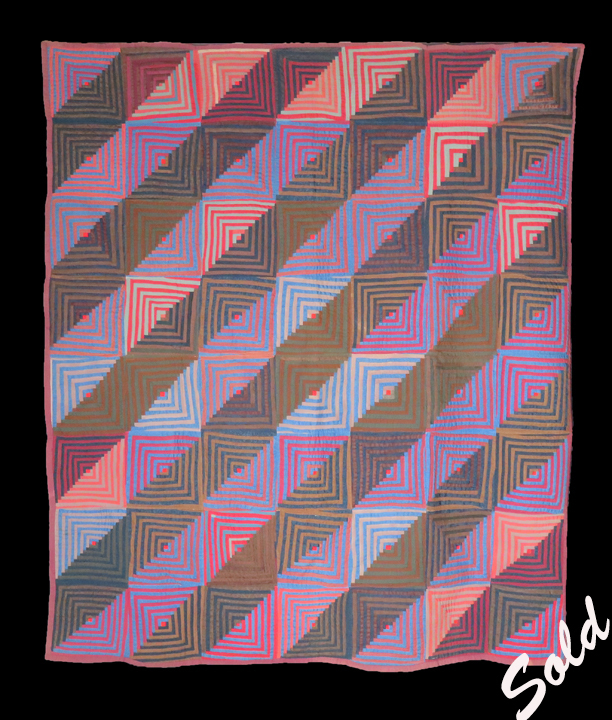 Wonderful solid colors are hand pieced in a combination of the Roman Bars and Pyramids patterns to make a glorious example of the finest in textile graphic art. Pyramids measure approximately 6" per side with 7/8" wide bars in alternating solid colors of brown, ecru and red homespun linsey-woolseys and wool challis. 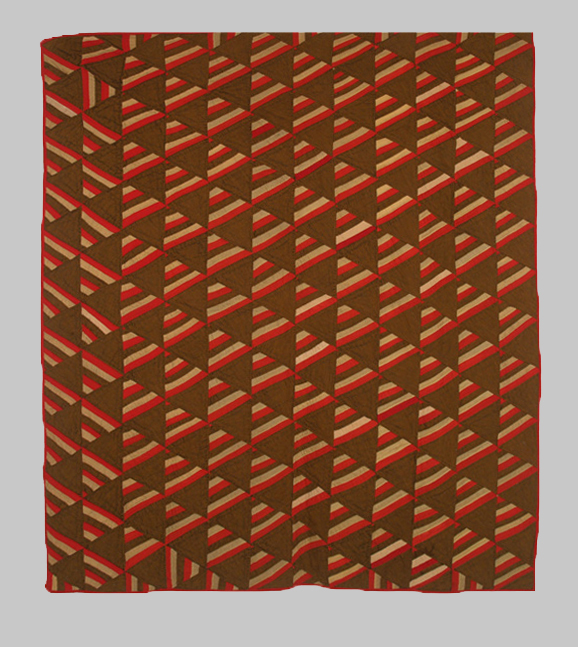 Solid pyramids are homespun brown linsey-woolsey woven using two colors - brown and gold. Gorgeous. Hand quilting in outline and diagonal lines is executed in brown and black threads. The backing is a c.1885 large scale floral challis in soft mauve, palest blue and ecru on solid brown. See detail image. The hand applied solid red binding is the same wool used in the pieced top. One of Betsey's personal favorites this wonderful quilt can be sent to you on approval for private viewing in your home. Ask her for more details. A stunning 19th century quilt in unused condition from the Chester County area of Pennsylvania showcases this quilter’s unique artistic perspective and advanced skill. She took a traditional foundation pieced Log Cabin Barn Raising pattern and, using stunning c.1870 and earlier wool challis fabrics, made it her own. An exceptional personal achievement using a striking color palette accented with an unusual triple border and scalloped edging. A veritable feast of colors and patterns is displayed in the wide array of blues, fuschia, green, red, browns and blacks in solids, plaids, and prints. Each log cabin measures approximately 9 1/4" x 9 1/2" with logs measuring 1/2" to 3/4" wide. At each cabin’s center is a 1 1/4" square solid fuschia chimney. The unusual triple border treatment further sets this Log Cabin apart from its more traditional sisters. An inner 2" border of deep purple frames the barn raising design. It is flanked by a solid green 1 ¾” border and a scalloped red border 2 1/2" at its widest points. The outer scalloped edge is finished with a ¼” black wool tape binding applied by hand. The backing is a beautiful wool challis plaid c.1870 indicating this quilt's maker was from an affluent family. Such an expensive fabric would only be used as a backing by a family of some means. This amazing antique quilt has incredible visual impact. Its large size makes it ideal for a contemporary sized bed or it would be stunning hung as graphic art on the wall. Please ask to see this quilt on approval in the privacy of your home. What a wonderful variation on the traditional Fan quilt design! Special care was taken by the maker evidenced by the added touches to her fanciful and rather lively quilt. Lovely and varied wools and wool challis in a multi-hued palette make up the fans which are each hand embellished with a combination of gold and ecru silk floss in the featherstitch pattern. Fans are arranged in an almost ‘snail trail’ pattern which adds movement for the eye and injects a sense of fun to an already beautiful quilt. Each fan block measures 6 ¾ inches with the spokes a mere 3 inches long. A fancy pattern of long and short blanket stitches in gold and ecru silk floss is an added decoration for the pillowcase edging. The backing on this piece is a soft and lovely confederate blue with amusing and very puffy pom-pom reverse ties in white wool yarn. A few original moth holes here and there on the backing attest to it being all wool. This is a fantastic fan quilt just filled with positive energy. It’s a great size to use as art on that special wall or use it as a throw on the couch for those cool evenings. One of Betsey’s favorite finds. Remember, it can be sent to you on approval. A fabulous wool folk art crazy quilt with a myriad of interesting and unique symbols and embellishments straight out of this quilter's imagination. Various solid and patterned worsted wools, challis and wool suiting fabrics combine in a muted palette of olives, browns, wine, black and ecru to form the subtle background. The artist used this as a canvas onto which she embroidered both whimsical and traditional designs using solid and variegated wool yarns in bright, warm hues. Appliques of crocheted wool and bright wool challis in amorphous shapes and geometrics add even more charm. Central to the quilt's design is a block of uniform bricks around which the other fantastical shapes and elements flow. The backing of this quilt is a tan and ecru plaid and is the foundation onto which each piece is stitched. The 3/8" binding is an applied olive green wool challis. Wonderful warmth and movement make this quilt a great choice to use as the focal point in any room. 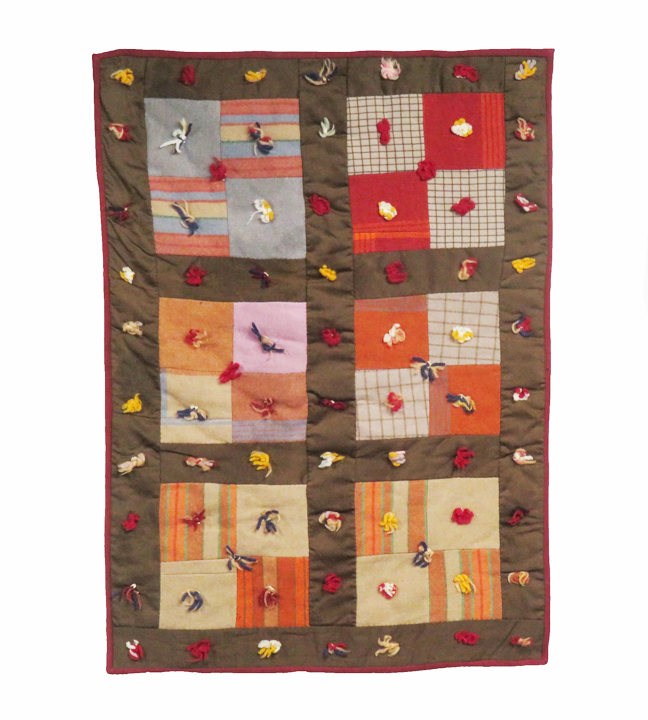 Folk art sophistication and whimsy at its best, this is a wonderful and unique quilt that can be sent to you on approval. Some of the earliest mummers date back to early Egypt, pagan Rome and Greece, England, Germany, and France. Historically, Mummery has influenced customs and perpetuated many interesting traditions. The use of masks and different costumes were carried over from the Greek celebrations of King Momus, the Italian-feast of saturnalia, and the British Mummery Play. All of these cultures passed along their traditions from generation to generation, and eventually these traditions were brought to America by immigrants. The tradition of Philadelphia Mummery started in the late 17th century as a continuation of the Old World customs of ushering in the New Year. Mummery in America is as unique to Philadelphia as Mardi Gras is to New Orleans. The symbols of the Philadelphia Mummers include musical instruments, moons, hearts, diamonds, stars, weaponry, as well as silhouetted faces. 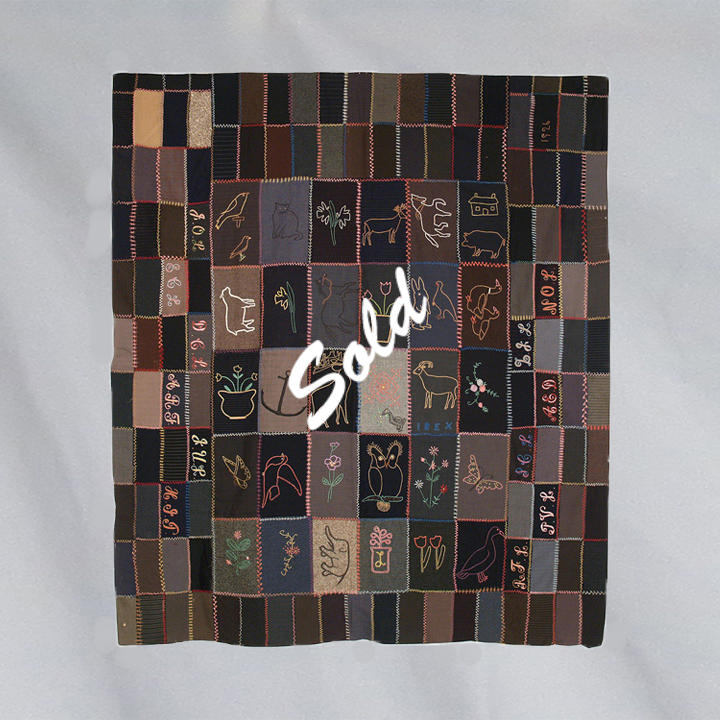 Many of these symbols have been incorporated into this circa 1890 folk art Mummer's quilt. Beautifully pieced wool and wool challis fabrics in solids, plaids and floral prints comprise this large, very decorative piece of Philadelphia history. The symbols themselves are cut from solid felted wool and the fine wool embroidery used throughout is both precise and exuberant in color and style. A 4 ½" double border in two shades of tan wool challis frames the inner design and has intricate embellishment along the entire border seam on four sides. The backing is a brown, red and yellow small scale plaid cotton with a 5/8" applied brown wool challis binding. In excellent condition this quilt is a rare find. Our quilts are always sent on approval. 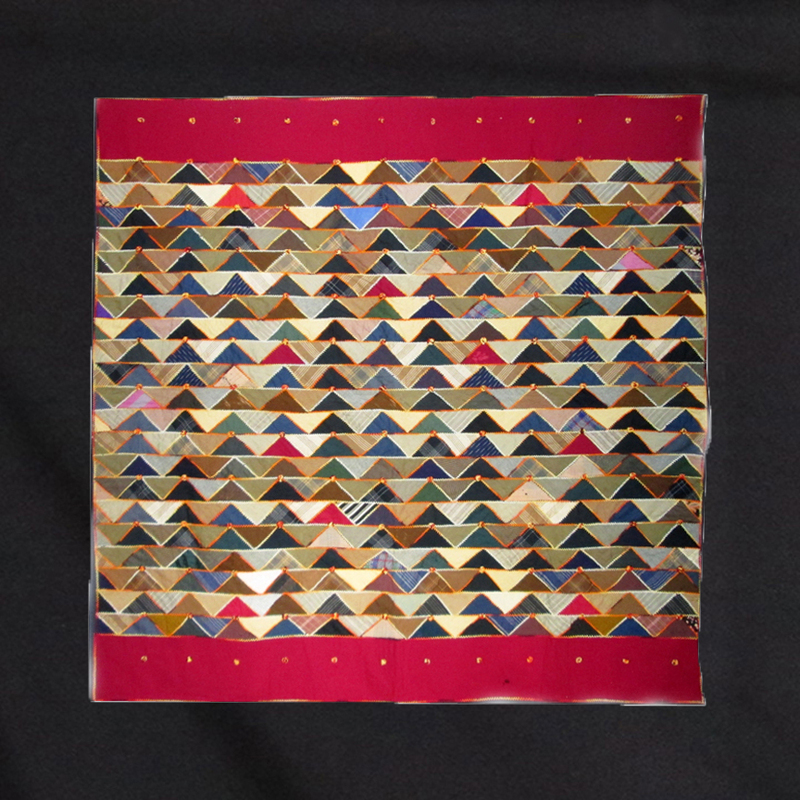 A wonderful example of an early quilt pattern using wool and wool challis fabrics. 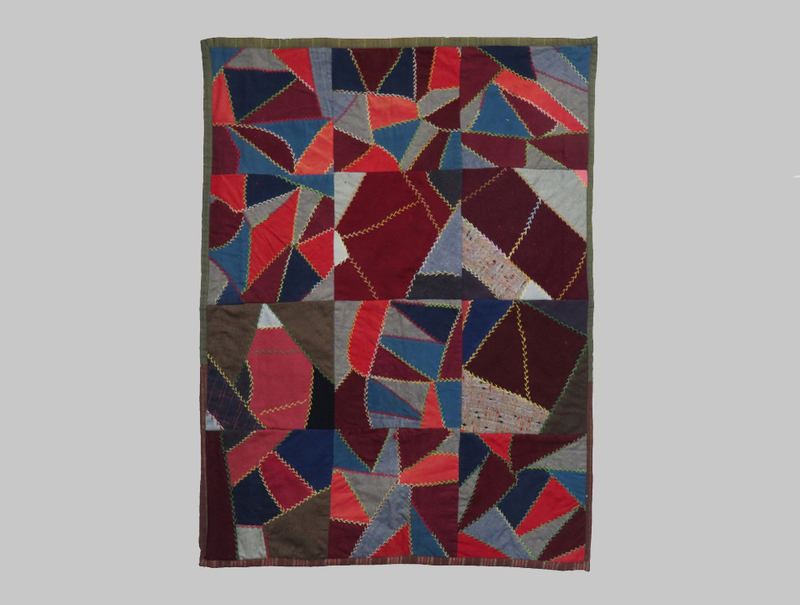 This quilt is executed in a warm and vibrant color palette in shades of blue, brown, black and green with splashes of red and pink. Each of the hundreds of hexagons measure 1 7/8”. Central to each hexagon pattern is an embroidered three leaf clover. Double borders, one in black and the other in deep olive black wool challis grace the outer edge of the quilt design. The backing is a beautiful black and deep fuchsia check. A very fine black wool challis is used for the applied 3/8” binding. Hand quilting is executed in dark thread in diagonal crosses and outline stitching enhancing the geometric design in this quilt. The creator of this piece had a wonderful sense of design which she employed using vibrant plaids placed strategically, adding interest and spark to her creation. In unused condition, this quilt is a wonderful rendition of the 19th century mosaic pattern and a sophisticated example of antique textile art perfect for a bed or displayed as art on the wall. Remember, our quilts are always sent on approval. 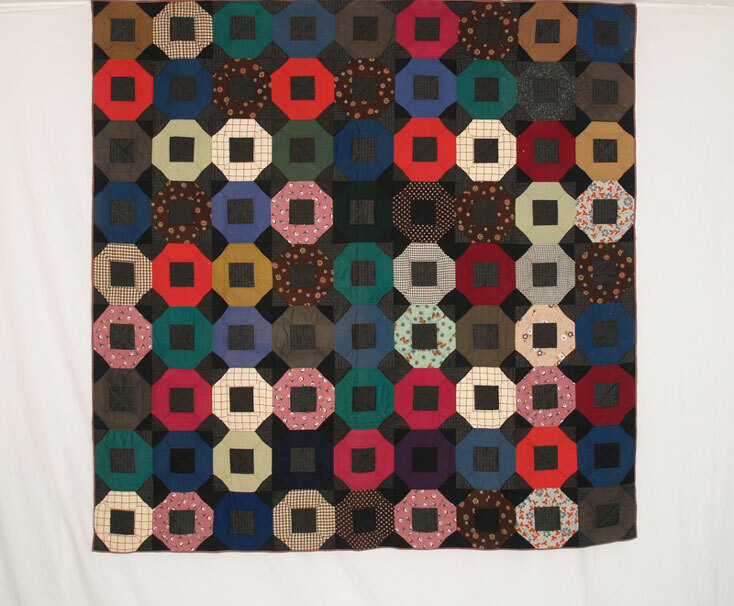 The dual color quilting in a Log Cabin Barn Raising formation over the Wool Bricks pattern places this wonderful Old Order Amish piece in the out-of-the-ordinary category. Using both red pearl cotton and white quilting threads the lines are parallel to each other and approximately 1 1/2 inches apart with just the red going through to the backing. 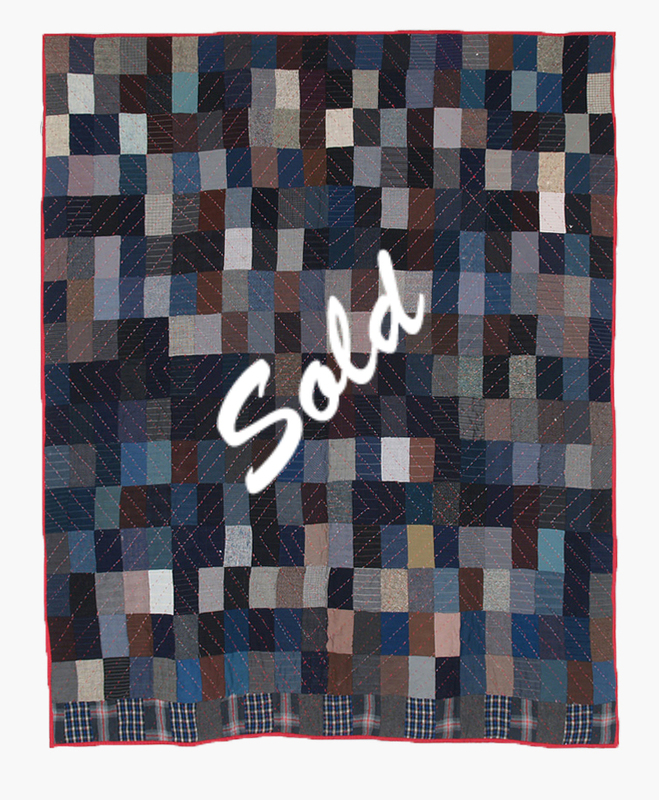 The hand pieced and quilted Wool Bricks pattern is made up of wool suiting rectangles measuring approximately 2 ¾ x 4 ½ inches in shades of navy, deep green, browns, blue, grey and tan. 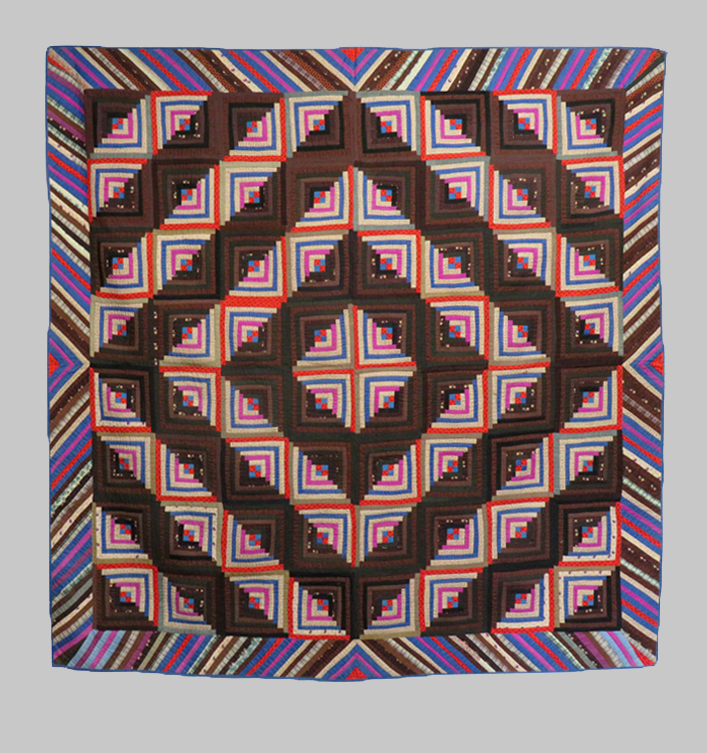 The quilting with its 3-D, almost pulsating, effect has created an extremely unusual textile that transcends decors and is at home in either a glass and chrome home or an early American colonial. Red cotton backing is turned from back to front to form the ½ inch binding. In unused condition this quilt is ready to use. It can be shipped to you on approval for viewing in the privacy of your home.